Legendary Carmelite building (17th century garden and fruit trees) in Granada, situated in the suburb of Albaicin (historic city centre, World Heritage Site), just opposite the Alhambra and with lovely views. Picturesque and welcoming garden terraces on different levels and with pretty fountains. A house in the center of Granada. Private: swimming pool (3 x 12 m, 01.06.-30.09.). Parking. Grocery store 80 m, restaurant 20 m, bus stop 80 m. Old town, cobbled paving with pedestrian areas and uneven streets. Cathedral 800 m (walking). There is a free cleaning session and change of linen for stays of a minimum of 2 weeks. 300 euros deposit. House "Carmen Del Agua". In the centre of Granada. 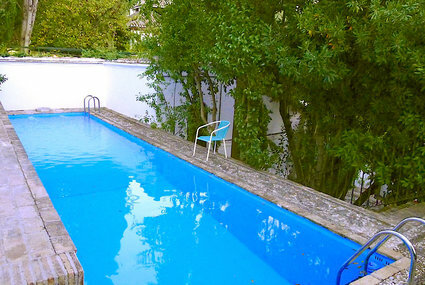 Private: swimming pool (3 x 12 m, 01.06.-30.09.). Parking. Grocery 80 m, restaurant 20 m, bus stop 80 m.